Electoral Commissioner Patilias Gamato must not further undermine the integrity of the national election by declaring Ialibu-Pangia ahead of other seats. 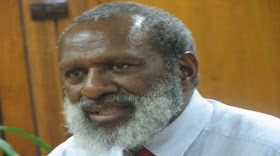 Doing so would send a clear signal to Papua New Guineans that the manipulation of the election is continuing with one aim in mind – the formation of a PNC-led Government. The declaration of Ialibu-Pangia first in the 2012 election undoubtedly gave an advantage to PNC candidates in seats where voting was continuing. There must not be a repeat. Ialibu-Pangia at the very least should not be declared before counting ends in other Southern Highlands seats. Mr Gamato, the Election Steering Committee head Mr Isaac Lupari, and the Prime Minister have done enough damage already. The orchestrated chaos has caused Papua New Guineans to lose faith in the Electoral Commission, and there is widespread doubt about the outcome of the election itself. To declare Ialibu-Pangia first would be the final nail in the coffin of public confidence and would render the election result meaningless. There have been too many attacks on the integrity of the election already. It has been undermined by the fatal flaws in the electoral roll, alarming irregularities with ballot papers and ballot boxes, poor planning by the Electoral Commission, and abuses of people’s Constitutional rights and freedoms. To try to give an advantage to one party by selective declarations of seats would be just one more piece of unacceptable manipulation.